R-37M at 2013 MAKS Airshow. 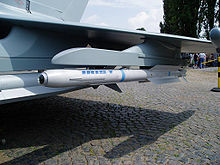 A IRIS-T air-to-air missile of the German Air Force. Meteor (missile) for Typhoon fighter jets. The air-to-air missile grew out of the unguided air-to-air rockets used during the First World War. Le Prieur rockets were sometimes attached to the struts of biplanes and fired electrically, usually against observation balloons, by such early pilots as Albert Ball and A. M. Walters. Facing the Allied air superiority, Germany in World War II invested limited effort into missile research, leading to the deployment of the R4M unguided rocket and the development of various guided missile prototypes such as the Ruhrstahl X-4. Post-war research led the Royal Air Force to introduce Fairey Fireflash into service in 1955 but their results were unsuccessful. The US Navy and US Air Force began equipping guided missiles in 1956, deploying the USAF's AIM-4 Falcon and the USN's AIM-7 Sparrow and AIM-9 Sidewinder. 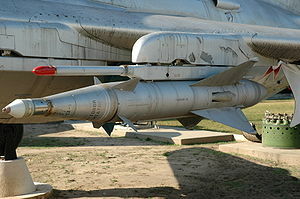 The Soviet Air Force introduced its K-5 (missile) into service in 1957. As missile systems have continued to advance, modern air warfare consists almost entirely of missile firing. The use of Beyond Visual Range combat became so pervasive in the US that early F-4 variants were armed only with missiles in the 1960s. High casualty rates during the Vietnam War caused the US to reintroduce autocannon and traditional dogfighting tactics but the missile remains the primary weapon in air combat. Radar-guided missiles can be countered by rapid maneuvering (which may result in them "breaking lock", or may cause them to overshoot), deploying chaff or using electronic counter-measures. Active radar (AR)-guided missiles carry their own radar system to detect and track their target. However, the size of the radar antenna is limited by the small diameter of missiles, limiting its range which typically means such missiles are launched at a predicted future location of the target, often relying on separate guidance systems such as Global Positioning System, inertial guidance, or a mid-course update from either the launching aircraft or other system that can communicate with the missile to get the missile close to the target. At a predetermined point (frequently based on time since launch or arrival near the predicted target location) the missile's radar system is activated (the missile is said to "go active"), and the missile then homes in on the target. A missile is subject to a minimum range, before which it cannot maneuver effectively. In order to maneuver sufficiently from a poor launch angle at short ranges to hit its target, some missiles use thrust vectoring, which allow the missile to start turning "off the rail", before its motor has accelerated it up to high enough speeds for its small aerodynamic surfaces to be useful. Early short-range missiles such as the early Sidewinders and K-13 (missile) (AA-2 Atoll) had infrared seekers with a narrow (30-degree) field of view and required the attacker to position himself behind the target (rear aspect engagement). This meant that the target aircraft only had to perform a slight turn to move outside the missile seeker's field of view and cause the missile to lose track of the target ("break lock"). The R-73 (missile) (AA-11 Archer) entered service in 1985 and marked a new generation of dogfight missile. It had a wider field of view and could be cued onto a target using a helmet mounted sight. This allowed it to be launched at targets that would otherwise not be seen by older generation missiles that generally stared forward while waiting to be launched. This capability, combined with a more powerful motor that allows the missile to maneuver against crossing targets and launch at greater ranges, gives the launching aircraft improved tactical freedom. Other members of the 4th generation use focal plane arrays to offer greatly improved scanning and countermeasures resistance (especially against flares). These missiles are also much more agile, some by employing thrust vectoring (typically gimballed thrust). MAA-1B Piranha – IR-guided missile. Matra Magic II – IR-guided missile. MBDA Meteor – long-range active radar-guided missile, to be integrated on Rafale by 2018. Alenia Aspide – Italian manufactured version of the AIM-7 Sparrow, based on the AIM-7E. PL-1 – PRC version of the Soviet K-5 (missile) (AA-1 Alkali), retired. PL-2 – PRC version of the Soviet Vympel K-13 (AA-2 Atoll), which was based on AIM-9B Sidewinder. Retired & replaced by PL-5 in PLAAF service. MBDA Meteor – long-range active radar-guided missile, pending contract for integration on Eurofighter Typhoon. ^ "Atmospheric Effects on Electro-optics". Retrieved 4 November 2014. ^ a b Carlo Kopp (April 1997). "Fourth Generation AAMs - The Rafael Python 4". Australian Aviation. Retrieved 2007-03-08. ^ Carlo Kopp (August 1998). "Helmet Mounted Sights and Displays". Air Power International. Retrieved 2007-03-08. ^ "New Avionics For Gripen, Typhoon And Rafale". Retrieved 4 November 2014. ^ a b "First Tranche 3 Typhoon Readied For Flight". Retrieved 4 November 2014. ^ "Allgemeine Luftkampfraketen". Retrieved 4 November 2014. ^ "Fatter - Jane's Air-Launched Weapons". Retrieved 4 November 2014. ^ "Sedjil - Jane's Air-Launched Weapons". Retrieved 4 November 2014. ^ "Iranian F-14 Tomcat's new indigenous air-to-air missile is actually an (improved?) AIM-54 Phoenix replica". Retrieved 11 February 2015. ^ "There's No Escaping MBDA's Meteor Missile". Aviation International News. Retrieved 4 November 2014.